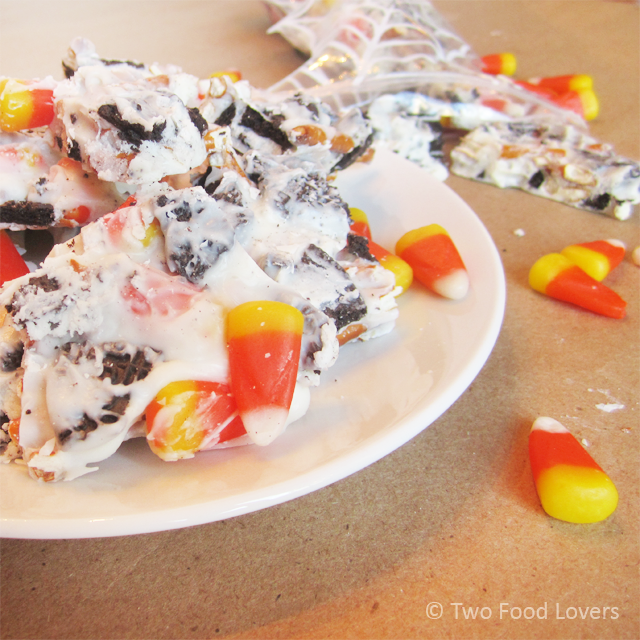 Candy corn lovers will devour this sweet & salty treat. 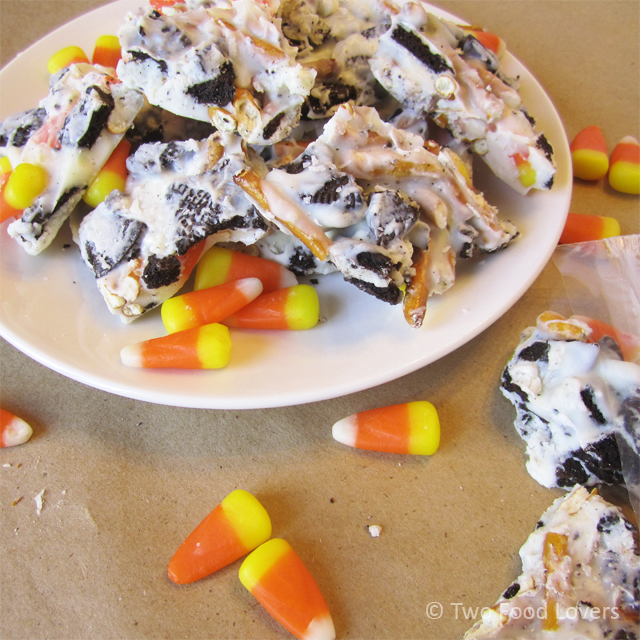 Stuffed with Oreos, pretzels and candy corn, this crunchy Halloween Bark is so tasty! These last few weeks have been incredibly busy. I'm always baffled at how women work full-time and have families, AND make time for things like a blog or hobbies. I already feel like I run around like a maniac. The mental to-do list in my head is constantly growing, and I'm tired. I'm tired all the time. Kudos to you mommies. Hopefully I can be like you one day, and not wear burn myself out. 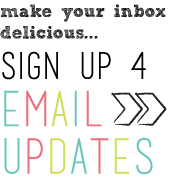 We've been prepping for a Harry Potter Halloween party (pictures to come soon), trying to stick to our normal routine (work, come home, workout, cook dinner, clean kitchen, watch a show or movie), play volleyball once a week, PLUS work on this blog. 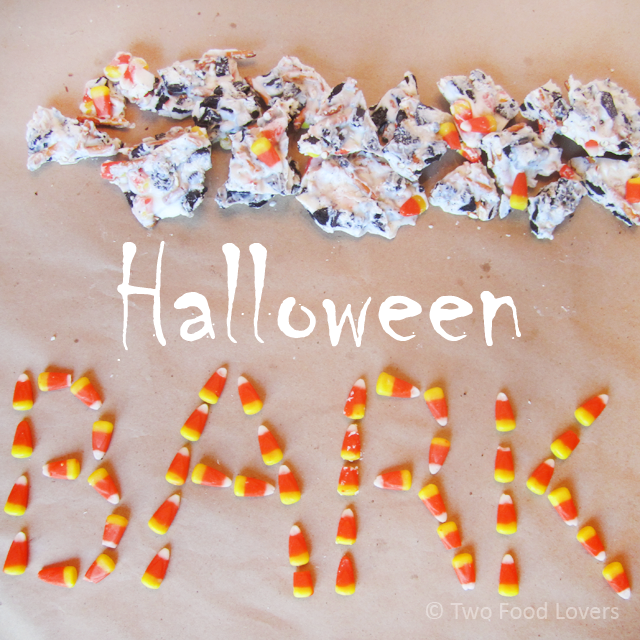 In one day I baked a batch of muffins, homemade cheesy potatoes to go with the ham my dad brought over and made this Halloween Candy Bark to share with the neighbors. The next evening after work I made a huge pot of potato soup and the soft pretzel bites you saw last week. WHEW! But it's so worth it. My only wish: a kitchen cleaning fairy. I have to admit, I'm not a candy corn fan. However, National Candy Corn Day is October 30. So, in the spirit of Halloween, I decided to make this festive treat. Now, let me admit something else, I loved it. Even the candy corn! This is definitely a sweet treat, but the pretzel pieces add a nice touch of saltiness. Sweet and salty. You won't stop eating it. How can you not love something with Oreos in it? Did I mention how easy this recipe is to make? You can literally whip it up in no time. It makes a great after school treat for the kiddos, or you can surprise your co-workers by bringing in "homemade" candy on Halloween. Each bite is crunchy, melty, chewy goodness! This recipe adapted from The Girl Who Ate Everything. Step 1: Cover a large cookie sheet with parchment or wax paper. 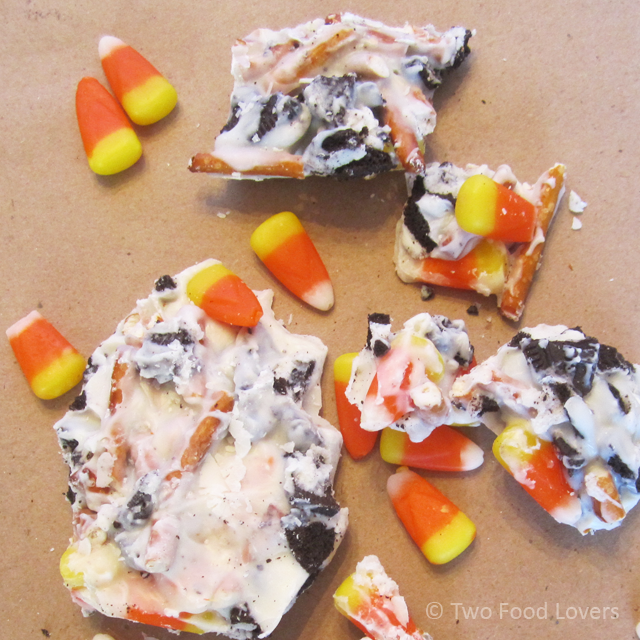 Gently toss Oreo pieces, pretzel pieces and candy corn in a bowl to combine. Spread out on paper lined sheet in a 9x13 inch shape. Step 2: Place almond bark in a glass, microwave-safe bowl, and heat on high for 90 seconds. Stir and heat for 20 seconds. Continue to stir and heat until completely melted. Step 3: Use a rubber spatula to spread the melted almond bark over the mix on the sheet. It will take some maneuvering to get all the mixture covered evenly, but do not add additional almond bark. Step 4: Place cookie sheet in refrigerator and let set for 60 minutes to ensure it is hardened. Once set, remove from fridge. Lift the edges of the paper to cover your hands and break the bark into pieces. © Two Food Lovers, 2014. All images & content are copyright protected. Please do not use our images without prior permission. If you want to republish this recipe, please re-write the recipe in your own words, or link back to this post for the recipe. Don't forget to tell us how you liked this Halloween treat in the comments below, and follow us on Facebook and Twitter!